“Auf wiedersehen!” … Austrian & Swiss for, “until we see each other again!” Check out of our hotel rooms early and head to Zurich by train and bus. We will have an early breakfast this morning, before loading our luggage onto a coach bus at our hotel at 7:00 am. We then board the Glacier Express train from Samedan station for a 7:16 am departure. The Glacier Express takes us along the impressive UNESCO World Heritage train route between St Moritz and Chur. Our bus picks us up in Chur with our luggage and drives us directly to the Zurich Airport, arriving by 11:00 am. Several guests have flights earlier than 12:55 pm today. We recommend taking an earlier train departing Samedan at 6:08 am with your luggage, to arrive at the Zurich airport by 9:42 am. If your flight departs earlier than 12:55 pm today, please communicate with Garrott for travel recommendations. We will arrive at Zurich Airport around 11:00 am. The bus will drop off any guests flying out today. Afterwards, our bus will continue to the Zurich Main Train Station to drop off any guests spending more time in Zurich. From the train station, public transportation and taxis are available to accommodations in Zurich. Check the Zurick City Information sheet for recommendations during your time there. Enjoy the rest of your stay in Switzerland and safe travels home! Today’s event is the Engadin Ski Marathon. Enjoy the 42km ski through the Engadin Valley and celebrate together afterwards! We begin early today, taking the train and bus to the start, along with 14,000 other skiers, experiencing the efficiency of the Swiss transportation infrastructure. The majority of the citizen waves start at 8:45 AM in Maloja. Ski the 42km marathon, finishing in S-chanf, or the 21km half-marathon, finishing in Pontresina. If you ski the half-marathon, you can take the train or shuttle bus to S-chanf to celebrate the event with the rest of our group. It is also a short ski or bus to our hotel, if you prefer heading there instead. Kick back and raise a glass together at the finish. We will be in one of the tents celebration after the event. You may wish to head back to the hotel to kick your feet up right after your race, or celebrate with the group. It’s up to you. Afterwards, there is a train that takes you directly from the finish in S-chanf back to Samedan. The late-afternoon is yours to do what you wish. This evening, we will meet before dinner to raise a glass to our week in Austria and Switzerland. Afterwards, a special dinner is planned at our hotel. Take an easy day today to prepare for the Engadin tomorrow however you wish. We have a short ski planned from Samedan and time to visit the Expo in St Moritz Bad for bib pickup and Worldloppet Passport holder reception (you do not need a passport to attend). We will have a special pre-race dinner at our hotel. We will meet briefly at our hotel this morning, before heading out for a ski. Ski as long or as short as you wish today. We recommend skiing approximately 10km to Zuoz or 15km to the Engadin finish in S-chanf, before taking the train back to Samedan. There are several villages with good lunch stops along the way, or grab a bite when you return to Samedan. Another option, if you do not wish to ski tomorrow’s course, is to take the trail from Samedan up the Bever Valley to Spinas on an out-and-back trail. 2:00 PM - You may choose to visit the Worldloppet passport holder reception at the Corviglia Tennis Center in St Moritz Bad. The bus is the easiest way to get there and back. Today, we take the 20 minute bus ride from Samedan to St Moritz Bad. From there, we ski one of the most scenic sections of the marathon, stopping for a bite at restaurant Lej da Staz along the way. In the evening, we travel back into St Moritz for the Night Springs. We will meet briefly this morning, before taking the bus from Samedan to St Moritz (approx 20 min). Explore the self proclaimed "Top of the World" and experience the pre-race atmosphere. We will ski one of the most scenic sections of the Engadin race course and preview the infamous "mattress downhill." After skiing through the Engadin Marathon 21km course finish, we will continue past Pontresina and stop at Muottas Muragl funicular. Travel to the top of Muottas Muragl for a view extending down the Engadin Valley, all the way to Maloja. Grab a bite for lunch, then rodel back down to the valley before skiing home to Samedan. In the afternoon, relax at the hotel or in the mineral baths across the street. As part of the race week festivities, the Engadin offers Night Sprints for elite skiers in St Moritz Bad at 7:00 pm. The festive atmosphere under the lights makes for an entertaining evening. There are food tents available to grab a bite at the sprints, or try one of the restaurants in St Moritz for dinner. This evening’s dinner is on your own. Your trip leaders are happy to make restaurant recommendations and reservations. Return to our hotel at your leisure by train or bus after the races, a short 15 minute ride from St Moritz. This morning we pack up and depart Seefeld for the Engadin Valley. We will take a funicular to the top of the Muottas Muragl mountain, overlooking the valley and sled back down, before a short ski back to our hotel. Our bus will bring us to the Muottas Muragl funicular for a trip to the top of the mountain overlooking the Engadin valley. On a clear day, there is perhaps no better place to orient yourself with the region. After lunch, you may want to kick back in the sun chairs or explore their igloo before sledding back to the valley. We will sled back to the valley on Rodels--traditional alpine sleds. Another option is to take the funicular back to the valley below. Our hotel is a short 5 km ski from the Muottas Muragl station along the Engadin ski trail. You may choose to get in a few more kilometers today or simply ski to our hotel. A brief train ride also takes you directly from Muottas Muragl directly to Samedan, where our hotel is about a 300m walk from the train station. The afternoon is yours to relax or explore the town of Samedan, our home for the next four nights. Our stay includes entry to Samedan’s mineral baths, a short walk from our hotel. …this is an excellent opportunity to relax this afternoon. Our hotel has a special welcome dinner planned for us before settling in for the evening. Link to Detailed Map of Engadin Valley Ski Trails (for download). A longer ski is planned for today, so you can explore the trails and sample the food in some of the huts around Seefeld. This evening, we have a special Tyrolean activity planned at our hotel before dinner. Meet by the fireplace wearing your ski clothes for a brief route review before we head out skiing. We will walk to the bus stop, this time taking the bus to the Wildmoos trailhead. Today, our plan is to spend a longer day skiing on the trails, making time for a lunch stop at the Ropferstubn, a hut with breathtaking views, and perhaps another hut or two along the way. Our ski today begins from the Wildmoos trailhead (hut 3). We start with a brief warm-up on A3 before heading out B3 to C11. From there, we take C6 to Ropferstubn (hut 19). Ropferstuben is perhaps our favorite hut in Seefeld, offering a full selection of traditional warm dishes. From here, options include taking the Katzenloch classic-only trail (double-poling and herringbone on skate skis is okay, too) or for a little more skiing, take C6 to A4, then cruise downhill on C10 to Moos, taking trails A5 and A6 back to the Alpenbad parking lot, where we took the bus home yesterday. Relax in the afternoon at the hotel after returning from your ski. Our trip leaders will share some language tips with us throughout the trip. However, language, food and skiing are only a part of the Austrian culture. A trip to Tyrol would not be complete without this surprise activity. After our activity, we have a meal in our hotel. Begin at Wildmoos (hut 3): A3 warm-up loop, B3 -> C11 -> C6 -> Ropferstubn (hut 19). 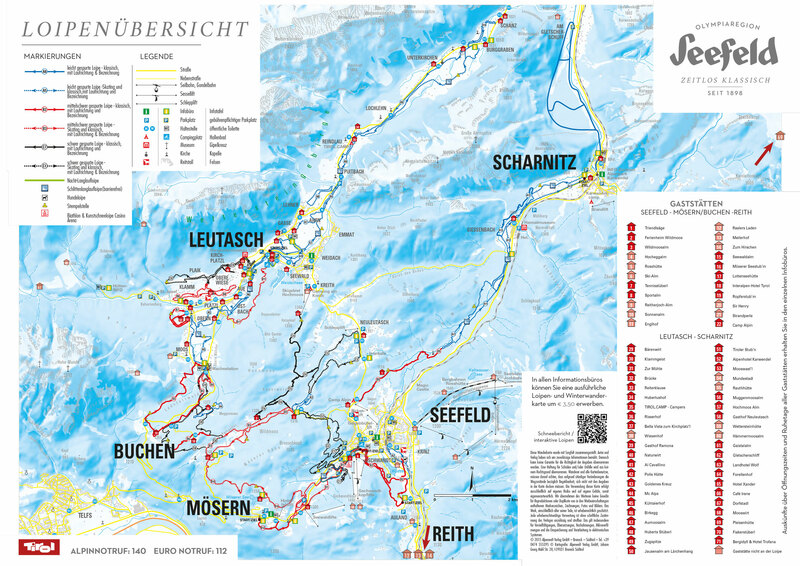 Today we’ll ski in Leutasch and familiarize ourselves with the local trail network. This evening, travel by train to Innsbruck for a brief walking tour and chance to explore the Olympic host city. We will meet this morning for a brief overview of the day, then take a short walk (~ 200m) to a bus stop and shuttle to Leutasch. We recommend simply walking in your ski boots, though there is some gravel on the roads that could scuff your boot soles. If you prefer, you could also wear shoes to leave at the trail head and carry your ski boots. You are also welcome to relax at the hotel or stroll through Seefeld this morning instead of skiing — it’s your vacation! Your trip leaders will each be on one of the options, though you are welcome to ski at your leisure on any trails you wish. There are several trail-side huts in Leutasch where you may choose to stop for lunch. There are regular shuttle buses returning to Seefeld. The ride takes around 15 minutes, followed by a short walk back to Hotel St Peter. Return to Seefeld in time to kick back and relax. Perhaps a nap is in order to recover from your travels. We will meet in the hotel lobby at 4:15 pm for an evening train to Innsbruck. The train ride from Seefeld to Innsbruck takes a scenic 35 minutes. We will have a brief tour of Innsbruck to help orient you within the city. You are free to explore Innsbruck at your leisure. Your trip leaders can make several restaurant recommendations, based on your wishes. This evening, dinner in Innsbruck is on your own. You are also welcome to stay at the hotel this evening, or travel back after the walking tour in time for dinner at the hotel. A train back to Seefeld leaves the Innsbruck station at 7:08 pm. After your evening in Innsbruck, your trip leaders will meet you in Innsbruck, at the same point where the walking tour finishes, at 8:15 pm to walk back to the train station and travel back to Seefeld. If you wish to stay later in Innsbruck on your own, the last train to Seefeld departs the station at 11:08 pm. Today we travel from Munich to Seefeld for the start of the Seefeld-Engadin trip. AS NO GUESTS ARE ARRIVING AT THE MUNICH AIRPORT ON MONDAY, THE BUS WILL NOT DO AN AIRPORT PICK-UP. Instead, the bus will pick up the whole group at the Hotel Stadt Rosenheim in Munich at 2:00 pm. If your plane is delayed and you end up arriving at the airport on Monday, please contact Garrott ASAP: gkuzzy@gmail.com or 612-214-2861. For guests spending time in Munich before our trip, our coach bus will arrive at the Hotel Stadt Rosenheim (Orleansplatz 6a), across from the Ostbahnhof (East Train Station) to pick you up around 2:30 PM. Our bus will be able to make restrooms stops along the way. Your trip leaders will meet you on the bus and give you a brief overview of the trip en route. You can let them know which style skiing you prefer to do tomorrow (skate or classic) and they will prepare your skis this evening. Settle in to your accommodation in Seefeld for the next week. Your trip leaders will take your skis and equipment to scrape off travel wax and prepare your skis for the week ahead. If you have time before your trip, it is helpful if you label your skis and poles with your name and style (skate or classic) -- especially if you have skis & poles for two people in one bag. Sleep well after your travels and sweet dreams for the week ahead!